The constantly shifting environment of the global economy coupled together with the exponential growth in modern technology has created a few unique challenges and varying opportunities for different markets. In terms of art, artists, art collectors and the art marketplace, there is an empty space where a monolithic, modern solution for trading art should be. All Public Art was created with the intention of filling this empty space by providing the art marketplace with a safe and reliable platform to conduct its business. 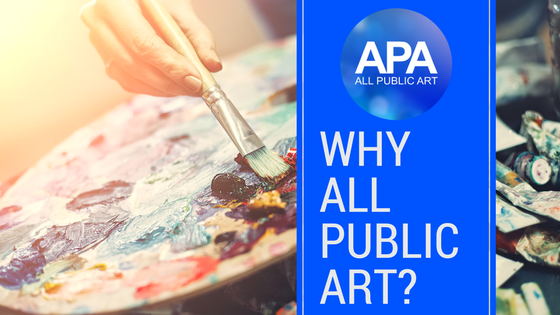 Using the APA platform, art creators and collectors are able to partake in a global marketplace that is geared towards fairness, security, transparency, and prosperity for the art community at large. The creation of this platform has been the main goal of All Public Art, who have tirelessly worked on an innovative way to leverage the powers of the latest blockchain technologies and cryptocurrencies. These technologies are able to manage and improve the way transactions in the art market are conducted. By merging the art world with the blockchain world, artists and collectors have the ability to buy and sell art directly to one another without needing any middle-man or third parties. Blockchain technology, aside from simply buying and selling, also assists in tracking and verifying the authenticity of an art piece in both digital and analogue domains. The nature of cryptocurrency and smart contracts allow every artist and art piece to have its own unique digital credentials which are protected from alteration by powerful cryptography. The transparency of transactions made through the blockchain along with the encrypted credentials provides for an additional layer of security. This allows the entire community to oversee transactions while guarding sensitive or private information. In addition to making use of existing blockchain technologies to facilitate the trade and prosperity of art, All Public Art has taken things a step further still by creating their own cryptocurrency, the All Public Art token. The token will be used exclusively for trading art through the All Public Art marketplace, giving it the ability to effectively minimize counterfeiting and other fraudulent transactions. This will help build trust and confidence in the trade of art as a form of currency unto itself. This has been a long time coming for artists to gain a way in creating a level playing field that will enable them to thrive in the art marketplace. In addition to the marketplace and cryptocurrency technology, All Public Art also brings the artist and collector a vast social network which they can be part of. Creating an account on the All Public Art network allows an artist to socialize, make connections, pull resources and information with other artists, and connect directly with collectors and galleries, all while providing a venue to feature and showcase their work. All Public Art can provide artists with opportunities through the social network by hosting featured artists, works and events for the community to see. It creates a hub by which the art community can grow a strong infrastructure and thrive in ways that were previously impossible, well as providing the art appreciator a place to go and observe art, discover new artists, contribute to and support artists. Like any social network, All Public Art’’s community will be ever-changing and constantly updating its network with new artists and works on a real-time basis. The creator of All Public Art, Graham Goddard, is an artist himself, which is why he set out to create a way for creators of the modern digital age to take their gift into their own hands and be the masters of their own destinies. All Public Art was created to support and empower artists so that a new era of art and artists can prosper into the future for countless generations to come.